Chicken is an inexpensive meat for a family dinner and this recipe shows how easy it is to make a recipe with a different slant to it. Consider cooking a whole chicken even if there are only one or two people for dinner. The cold chicken will be infused with the flavour and aroma of the garlic and is just as tasty cold in a sandwich as it is as a hot dinner. Whether you purchase a top of the range chicken or a budget price bird, a frozen chicken or a fresh free range one it is the flavours you add to it that make a very good dinner recipe. We all love a straight forward roast meal and chicken is one of the most popular but every so often and change is called for. Garlic chicken is definitely different. To keep the recipe from having too much fat when served drain off the residue of oil during the cooking period. Pre heat your oven to 200ºC or gas mark 6. Wash and pat dry your chicken. Take one Garlic bulb and break into individual cloves. Peel the cloves and crush them by putting under the flat blade of a knife and pressing down hard. Mix the crushed cloves of garlic with a large knob of butter and a little salt. Force the mixture under the skin of the chicken taking care not to break the skin as this will retain the flavour letting the butter moisten the meat of the chicken. Place the chicken into a large roasting tin. Take the other three garlic bulbs and break then down into individual cloves but do not peel them. Scatter them inside the cavity of the chicken along with the peeled and quartered onion and a heaped teaspoon of mixed herbs. Save about five and place them under the chicken to flavour the bottom side during cooking. 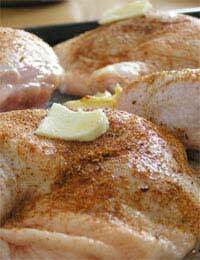 Rub a little melted butter on top of the chicken and scatter with black pepper, salt and more herbs. Cover with foil making sure that it does not touch the bird. Place in the preheated oven for one hour. Remove chicken and drain off excess oil. Replace back into the oven for another half hour for the chicken to brown before checking to see if it is cooked through. A skewer placed through the bird should show juices running clear if it is cooked thoroughly. When cooked remove from the oven. Take out the chicken cloves and onion. You will find that when squeezed the cooked garlic pulp will come out easily. Spread this over the chicken to add to the flavour. Place the chicken on a hot serving plate. Add a little water to the roasting pan along with gravy granules or cornflour and a stock cube to make your gravy. This is best served with seasonal vegetables and potatoes. If you wish to serve roast potatoes for dinner add boiled potatoes to the roasting pan after one hour. The potatoes will soak up the garlic flavour.